This product consists of a pair of 86.6 * 39.4inch curtain and 15 sets of adhesive hook and loops(30pcs,13cm per piece). Microholes can effectively keep insects, birds, bats, and dust out and meanwhile let the fresh air in. Powerful magnets enabling the curtain to be opened and closed quickly, without hindering children, and pets from entering into the home. You can adjust the distance by moving the Velcro a little bit, even after the door curtain is fixed. 1. Do not allow children to play on the curtains and do not let them hang on curtains! 2. Do not pass under the curtain with a candle or other flammable source as the curtain could catch fire. 3. Open the curtain only with your hands and never with sharp objects that can damage the net of the curtain. - Can be ironed with a low temperature iron. 100% Polyester material door curtain with Enhanced magnetic strip allows for the magnetic curtain to close more quickly and firmly. Machine sewn with double edged fabric makes the fly screen easier to clean with a longer service period. Compatible Door Size : The size of the magnetic screen is 87 x 39, which is easily adjustable during in the installation process to fit different door size .This magnetic screen fits door size : 86 x 38, 86 x 34, 86 x 30, 82 x 38, 82 x34, 82 x 30. IMPORTANT: Measure your door first to make sure our screen will fit. Reinforced Magnetic Strips and magnets are suitable for wooden, iron and aluminum doors etc. Easy installation without any tool required , no drilling required. Leave no trace residue on door frame when the curtain is removed. 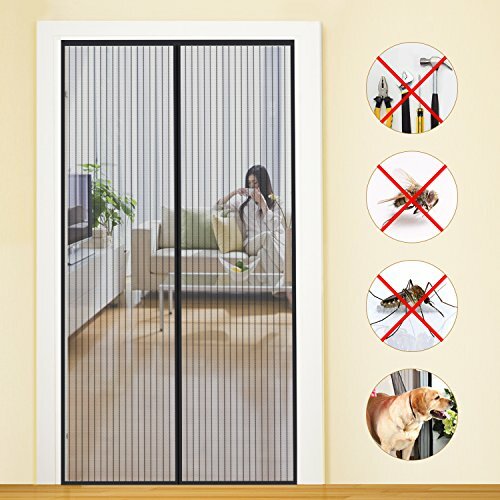 Magnetic Screen Door keeps bugs out, let fresh air in and easy for toddlers & pets to walk through freely, it makes your life more comfortable and easier! Say good bye to bugs for good! 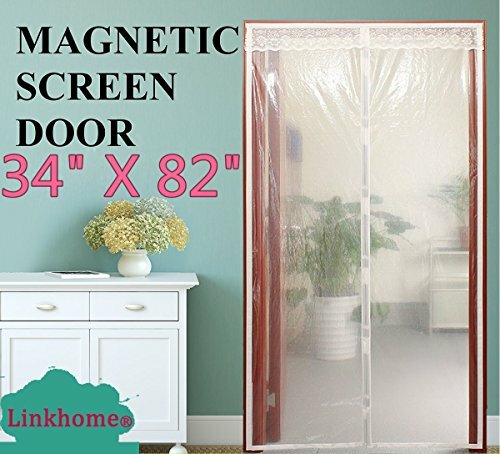 Buy correct size for magnetic door screen. Measure your door and door frame first, choose the size according to outer diameter. Don't buy the one which is smaller than your door frame, because it is not available for smaller one.Please make sure the center of the top mesh slightly higher than two sides. It is better to hang screen to the floor. MAGNETIC SCREEN DOOR: Color-Brown,Fits standard single and sliding doors. Magnetic screen door fits all door sizes up to 36"X82", Actual screen size 39"X83". Please measure your door! Stacked with 26 powerful magnets. Sewed on velcro and sewed seams make the product robust. Closed no noise! PROTECT YOUR HOUSE FROM UNINVITED INTRUDERS: Never breaks & no gaps. It really does work perfect and well made. Even the smallest bugs and mosquitoes have no chance to get in. While let fresh air in. To protect your child and your family not bitten by mosquitoes. It settles back in place after kids or pets move through it. EXTREMELY EASY TO USE: This top quality magnetic screen door allows you to walk through it with no effort. It also allows toddlers and pets to go through effortlessly and safely. This is the easiest way to maintain an insect free place. So you can carry food, drinks and some other things from inside to out, Children and pets also can go in and out of the house with ease. EASY TO INSTALL AND REMOVE: Magnetic door curtain design, It was very easy to install and works perfectly. Full frame velcro and screen door mesh replacement. It is installed for ease of use. When you don't need, Take down also is very convenient. Easy to install remove no tools required. The mesh door screen contains the roll of velcro in the Package. You can get a roll of velcro to attach the screen to your door and get a set of nails to add extra support to your screen. BUY WITH CONFIDENCE: Providing you with the friendliest customer service is our number one goal. We know you'll love our curtains as much as we do, if you're not 100% SATISFIED, let us know and we will make things right: full refund or a free replacement, whichever you would prefer. Best customer service on Amazon. Buy now! Note: 1. The magnetic screen door curtain can NOT be shortened! 2. Before ordering the magnetic curtain, please measure the size of your door. Features - Easy Installation,there is long sticky magic tape coming with the curtain.You could attach the curtain to the door fame without any tools. 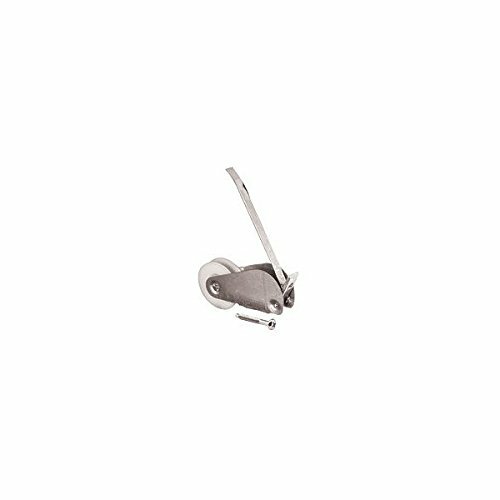 - Pins are includes, which could help you stick the mesh to the wooden door fame more effectively. 1. Tightly woven mosquito net which blocks out flies as well as possible 2. Made from high-quality polyester, more tear-resistant and durable. 3. Enhanced magnetic power,6 pairs of Magnetic Strips and 7 pairs of magnet pieces.Always seals completely. 4. Free up your hands while opening it 5. Wide range of applications,Eg,balcony door, bedroom, kitchen, children's room. 6. Powerful magnets sewn in, from top to bottom, automatically perfect gap free seal.Walk through hands free.Pets enter & exit freely, you don't need wait to open the door for pets dogs or hearing their scratching barking for door opening. 7. Enjoy fresh air without all the bugs flying in the house, You don't have to worry about flies and mosquitoes coming in, make your baby sleep more stable. Magnetic screen door size - 90 * 210 cm (35.4'* 82.6 inches), please measure your door size before purchase. Plug-in Free: This is a good protector to keep mosquitoes away from your house, but spreads fresh air through the fine mesh. 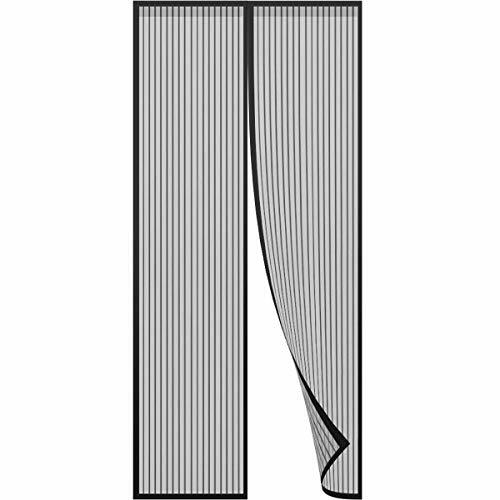 Automatic closing: Strong magnets are sewn to the edges of the shiny nylon fabric to keep the network together.When you pass through the curtain, it can close automatically without any gap. High quality: Made of high-quality materials, fine mesh can be used for a long time and it is not easy to tear.The fabric sewn on both sides retains the mesh and magnet well. Easy installation: Long sticky tape is stuck on the curtain.Without any tools, you can hang curtains on the door. Including stitches, which can help you to paste the grid onto wooden doors more effectively. 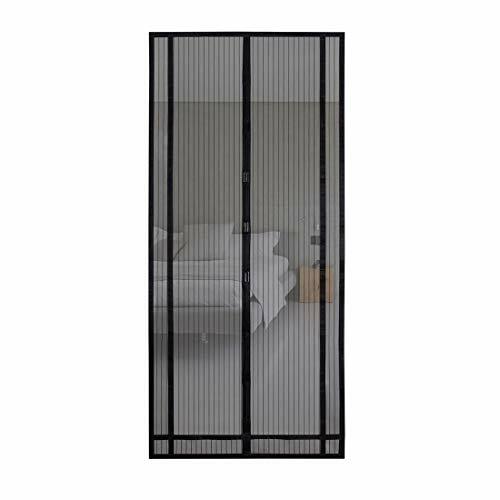 TRANSPARENT MAGNETIC SCREEN DOOR 34"(w) X 82"(h) : Fit for french doors, patio doors and sliding glass doors, Please measure first ! MADE OF PREMIUM EVA QUALITY MATERIALS : Smooth & Durable , You will love the feel of this door curtain, it doesn't feel stiff and rough,it feels smooth to the touch, Walk through hands free, closes no noise and use a longer time . TEMPERATURE PROTECTION : Our door curtain is thickness(0.15mm),with this thickness, ENERGY EFFICIENT , it can totally prevent heat loss,stops winter cold,save electricity and money,reduce outside noise,create a cool summer and warm winter. Enjoy Comfortable Life :This works perfect to keep kitchen insulated from the rest of the house.Also blocked cooking door from spreading to rest of house.Transparent color gives you a better view, Good sealing performance keep bugs out and anti dust-mite. NO RISK , BUY WITH CONFIDENCE : Easy to install & remove without any other tool , We are so confident in our product,we offer a no questions asked 6 month money back guarantee. We love spring and summer for sun, fun and barbecues, but it also brings mosquitoes, flies and other insects into our homes. That's why we invented MYCARBON magnetic screen doors. Instead of hiring someone to install an expensive framed screen door,MYCARBON screen doors save time, hassle and money. All in one - No tools required for our retractable screen door.The included Velcro is used to fix screen. First install the Velcro on the door frame, then attach the screen directly and easily to the door frame. 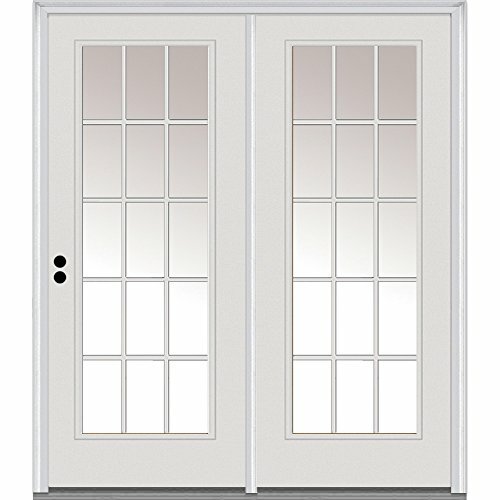 For installation of the invisible screen door ,there is no damage to the door frame from drilling or nailing. Keeps fresh air in and annoying bugs out by the sliding screen door The mesh screen door opens easily and then instantly closes behind you.You can be sure no one leaves the screen open to allow bugs in. Keeps your doors open for natural cooling. Bugs off screen doors saves money and energy while keeping the bugs out,makes any door a pet door that your pets can get through without problem.No need for extra pet doors, or doggie doors. Large and small pets come and go as they please. Why shall I choose MYCARBON magnetic door screen ? - Strong magnets to provide seamless automatic closure screen doors. - Offers hands free entry and exit retractable screen door . - Great for guests who forget to close the magnetic screen door. - Fits single doors, sliding doors, RVs,patio door and more. Easy installation without tools MYCARBON Magnetic Screen Door can be set up in seconds - no tools required.Easy to install this handy mesh door quickly with Velcro which protect the door frame from drilling or nailing without any other tool.Magnetic screen door Size: 36*83''(90*210cm) ,ideal for inside door frame within 75-84cm, and outside door frame within 88-95cm . Super magnet,automatic and tight close with hands free This easy screen doors use 6 pairs of powerful magnetic stripes, and 7 pairs of magnetic blocks. With the screen doors' magnetic auto-close feature,the screen for patio can close automatically each time you pass through it with hands free for you, family, guests and pets. 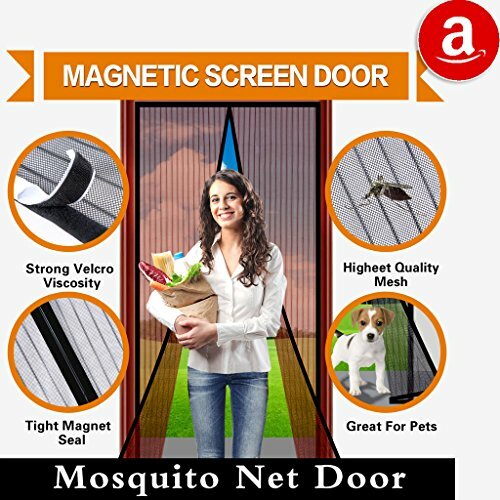 Keep bugs out sliding screen door Powerful magnets automatically close the screen for patio and keep annoying insects like mosquitoes, bees, flies, moths, birds and leaves outside,prevents you from infectious diseases by insect bites, you can enjoy a healthy and comfortable summer by this mosquito door net. Let natural cooling fresh air in With this sliding screen door, let fresh air in but annoying bugs out. For its transparent function,you will never miss any story and scenery outdoor. 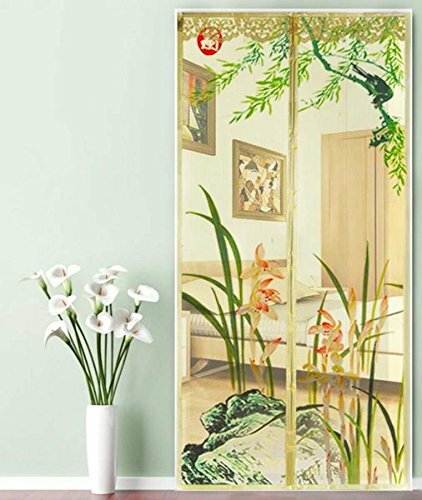 This sliding screen door can be used on your bedroom,children's room,kitchen, patio door and more. 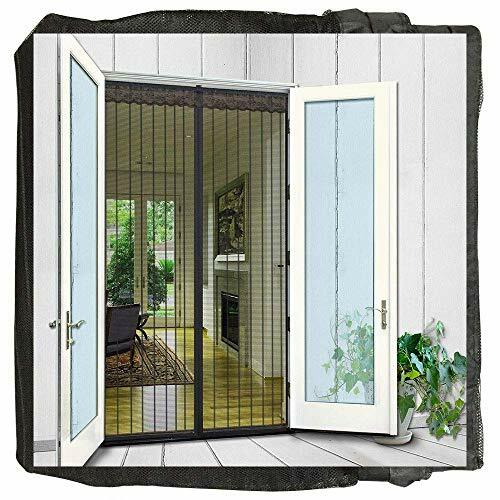 Must have in summer or all year long Fly Screen Door This fly screen door can remain up all year long or fold up for easy storage when not in use. You must have this mesh screen door in summer, and It is ideal for spring,autumn,winter days, just look like an ordinary patio screens door. Used as top and bottom roller. 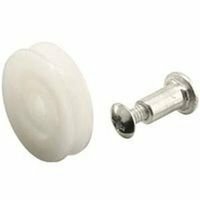 Plastic wheel with center groove. 1-7/8"L housing, heat treated, high tension steel spring, and No.8-32 x 1-1/4" Phillips pan head screw. Tired of opening your door on a sunny day and being attacked by insects and bugs swarming in or does your pet end up whining and scratching the door to be let in when for some reason you can not get the door instantly? While letting all the beautiful refreshing fresh air into your home.This clever door screen uses the magnets along its opening that will snap shut automatically after you, your pets or family walk through. Snapping shut behind you the Snap Screen will not give those flies, moths, mosquitoes, wasps and or bees a chance to slip in. The Snap Screen is perfect for those sunny days when you and your pets and kids will be running in and out constantly. Fitting over single doors, sliding doors and caravan doors easily without the use of tools, screws or nails and when winter comes around it's easy to remove too! MAGNETIC SCREEN DOOR SIZE 72"x 80",for french doors,patio doors and sliding glass doors,please measure first. SIMPLE INSTALLATION:Installs in minutes without any tools,Attaches securely in minutes to most door frames using Velcro. 100% Guarantee--If for any reason you are not completely happy,simply return anytime for a full refund,there is no risk,add one to your cart now. This product consists of a pair of 90 * 63inch curtains and 15 sets of adhesive VELCRO strips(30pcs,13cm per piece). Micro holes can effectively prevent insects, birds, bats, and dust from entering into your home. Not only effectively prevent mosquitoes, bugs, flies and dust mites out, but also allows premium air circulation in. Ideal for child and pets easy access , directly walk through screen doors no matter for human or pets. 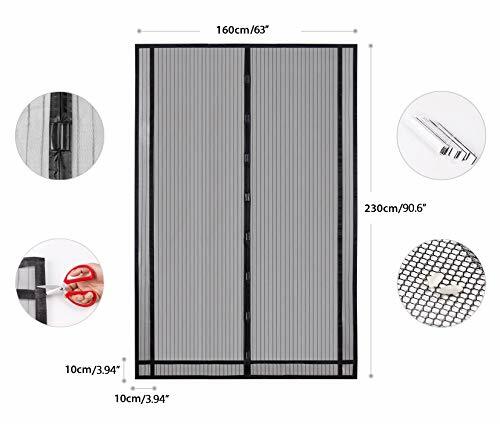 Compatible Door Size : The size of the magnetic screen is 91 x 63, which is easily adjustable during in the installation process to fit different door size .This magnetic screen fits door size : 89.8 x 61.4, 89.8 x 57.5, 89.8 x 53.5, 85.8 x61.4, 85.8 x 57.5, 85.8 x 53.5. IMPORTANT: Measure your door first to make sure our screen will fit. 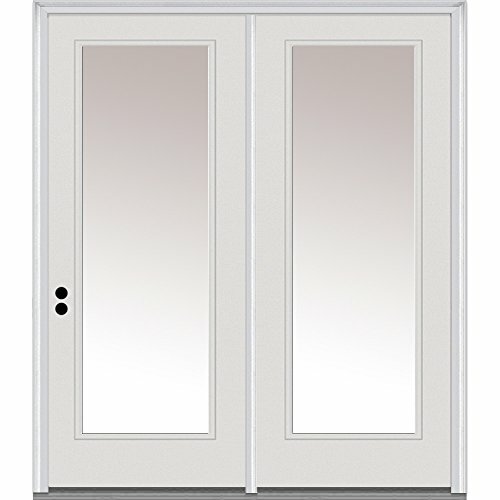 National Door Company Z001626R Steel, Primed, Right Hand In-Swing, Patio Door, Full Lite, 72"x80"
National Door Company Z001645L Steel, Primed, Left Hand In-Swing, Center Hinged Patio Door, Clear Glass Internal Grilles, 68"x80"
National Door Company ZZ01593R Fiberglass Smooth, Primed, Right Hand In-Swing, Center Hinged Patio Door, Clear Glass 15 Lite, 64"x80"
Storystore Magnetic Screen Door keeps bugs off, let fresh air in and easy for toddlers & pets to walk through freely, it makes your life more comfortable and easier! Note 1.Measure your door first, choose the size that fits your door. Don't buy the one which is smaller than your door. 2.Best for wood frame. Please do not buy this if you have a metal door, the magnetic will stick to your door and won't close. 3.Please make sure the center of the top mesh slightly higher than two sides. It is better to hang screen to the floor. Don't let too much screen put on the floor, it will impact the effect of closing. 4.The mesh is used for single door only. 5.Please read instructions before installation, it will help you install magnetic screen doors correctly. Suggestion : If you need extra hook&loop or to replace, please contect us on Amazon. Or send us a message by Amazon message system. Extensive Usage Scenarios Storystore magnetic screen door can be used in home outside door, kitchen door, bedroom door, study door and balcony door. When you don't use it, you just fold it up. Hasp Design This screen door prevents being blown open by wind, providing a good environment for pets and children to play in Heavy Mesh Construction Compared to average material on the market, our screen curtain durable, chemical corrosion resistance, good shape and have good light transmittance Keep Bugs & Mosquito Out High density net mesh made by polyester material can effectively stop the bugs and mosquito out. Screen Door Size Compatibility (MEASURE FIRST): The size of this magnet screen door is 39 width x 82 height inch--Fit your door size: 34 width x 82 height inch. The mesh use high-density and antioxidant material, strong and durable. Keep the bugs out and let the fresh air in.To learn more about our items please contect us . Built-in Strong Magnetic and Extra Gravity Sticks: 28pcs sewed in strong magnetic points make the screen door mesh curtain close much quicker and more silent. Extra 4 sets of gravity sticks (8 pcs) were added in the bottom sides to prevent the screen curtain from being blown open by wind. Full Frame Design and Push up Pins Support: Our screen curtain use the full frame design which enable you to remove the mesh curtain anytime; to secure the screen into its place much more stable, extra push pins was provided. Human and Pets Entry Friendly: directly walkthrough screen doors no matter for human or pets. And it is really easy for installation without any tool. 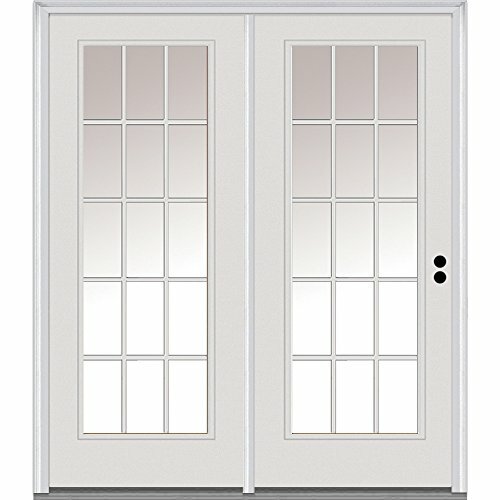 National Door Company Z001634L Steel, Primed, Left Hand In-Swing, Center Hinged Patio Door, Clear Glass 15 Lite, 72"x80"
National Door Company ZZ01604L Fiberglass Smooth, Primed, Left Hand In-Swing, Center Hinged Patio Door, Clear Glass Internal Grilles, 60"x80"
National Door Company Z001634R Steel, Primed, Right Hand In-Swing, Center Hinged Patio Door, Clear Glass 15 Lite, 72"x80"